We love celebrating the end of the year and marking the new one with traditions we’ve discovered on our travels. The Danish tradition of smashing dishes on your friends’ doorsteps on New Year’s Eve probably wouldn’t go over quite so well here in the US. And not many of us have Belgian cows and pigs to whom we can wish Happy New Year first thing in the morning. 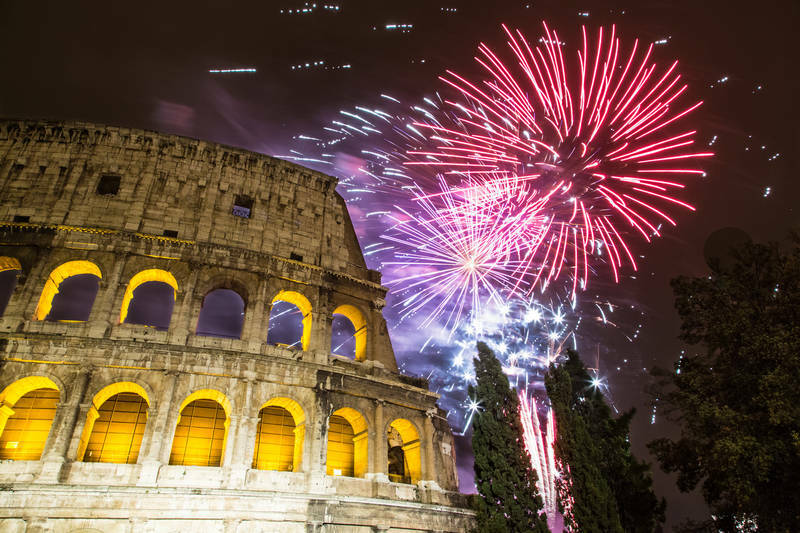 There are however some European New Year’s Eve traditions that would be lots of fun to try out at home this year. Here are some of our personal favorites. German New Year’s Eves are celebrated much like in other European countries — parties, fireworks and champagne. But there are a few things that make German celebrations unique. 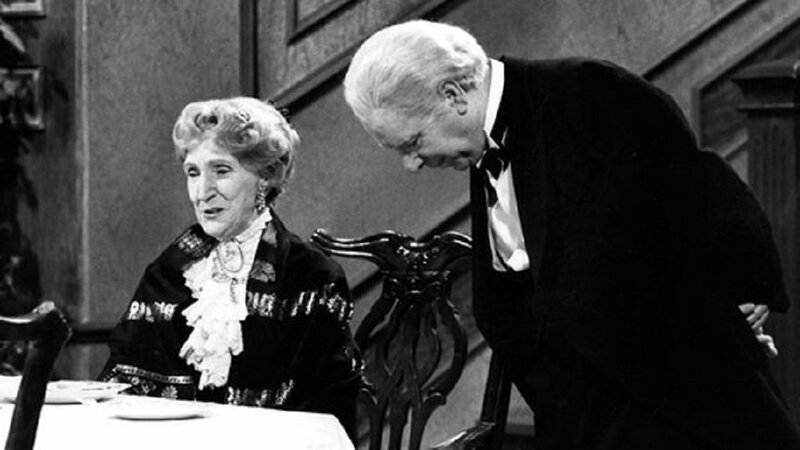 One of the strangest is their love of the 1963 British comedy sketch Dinner for One. It’s a short sketch played out by an older rich woman and her clumsy butler. Nobody’s quite certain how it became a must-see in every German home every New Year’s Eve, but you can watch it for yourself here. I’d love to hear what you think! Bleigiessen (lead pouring) is also very much a part of a German New Year’s Eve. We’ve tried it before (my daughter talks about it here), and we’re excited to try it again this New Year’s Eve. Years ago they would use actual lead pieces but have now replaced that with a non-toxic lead substitute or simple wax. You melt the wax on a spoon, pour the molten liquid into water and watch it instantly harden. 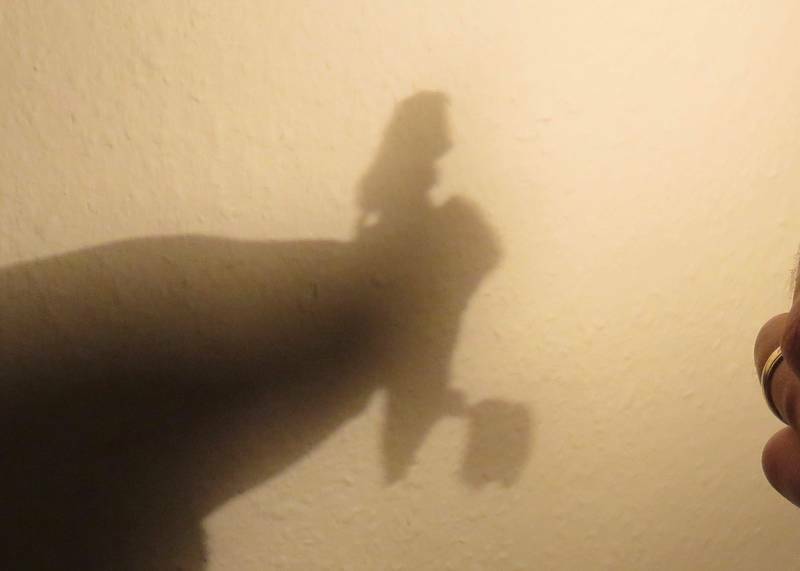 Then hold the hardened shape up to the light and analyze the shadow which predicts your fortune for the year. My fortune last year had something to do with this mermaid below…I’m still waiting to meet her though. While in America we count down and wait for the ball to drop, the Spanish take the last moments of the year to a more exciting level. With each stroke of the clock they shove a grape in their mouths. That’s 12 grapes in 12 seconds! Believe me, it’s harder than it sounds. Unfortunately, in Spain raisins don’t count as grapes. However successful one may or may not be in getting all of them down in time, it makes for some funny moments. And ending the year with laughter is always a good thing. If you subscribe to our stories, be sure to listen to ‘The 12 Grapes of Midnight’ with your kids to hear what happens when Lucia’s family gets separated just before midnight on New Year’s Eve in Madrid. It’ll inspire you to grab a bowl of grapes and start chewing for sure! 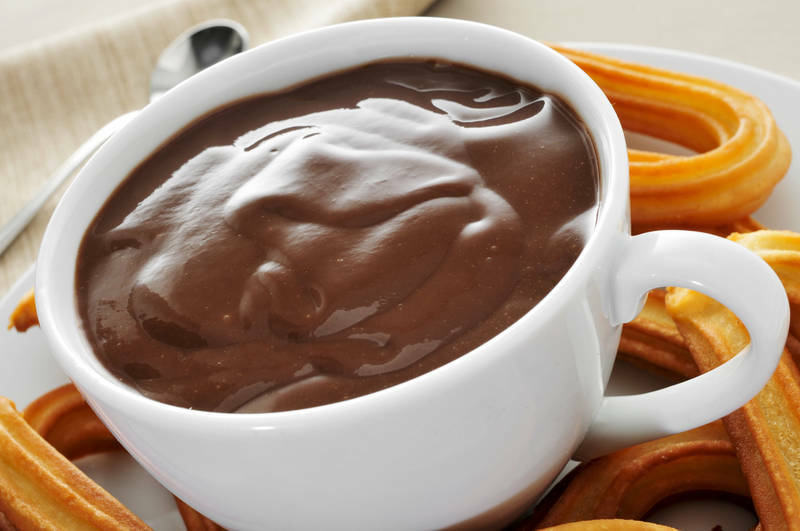 If grapes aren’t your thing, wait until morning for some Spanish churros and hot chocolate — a national New Year’s Day tradition. I remember the first time I ordered hot chocolate in Spain and basically got rich, creamy pudding – amazing. 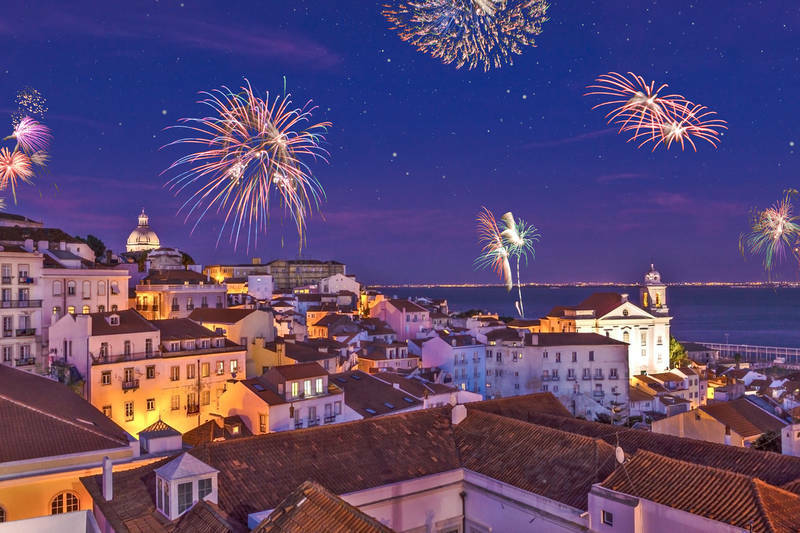 Just to the west, the Portuguese put their own twist on the 31st of December — what they call Noite Mágica (Magic Night). To start, they’ve traded in their 12 grapes for 12 raisins — each one bringing luck to the 12 months ahead. It seems like a safer version, even if it’s not quite as funny as the Spanish tradition. Once midnight comes around, the Portuguese start banging pots and pans with spoons to ward off evil while the Italians just throw their pans out their windows to represent leaving the past behind. But to really plan your future, be sure to watch the color of your underwear. It might just determine your fate for the new year: blue for luck, red for love, brown for success in a career and green for good health. Other Portuguese ways to bring good luck in the New Year are to dance around a tree, throw money toward the inside of your house and to jump on one foot three times while holding a glass of champagne. However you ring in the New Year, we wish you a year full of joy, love, learning and fun with your families! We’ve got some exciting plans for 2018 and can’t wait to share with you all soon. Happy New Year from NZ! Love all the fun traditions from around the world! Sounds like you are Back ‘home’ for now?! We’ve enjoyed the predictability of being back in a country we know and love- common language, super market labels we can read, no surprises behind toilet doors, familiar currency, library books (joyful excited kids regarding the latter!)etc. You know what I mean! All the best for your ventures in 2018!